This Legendary: Marvel review was made after playing the game eight times. 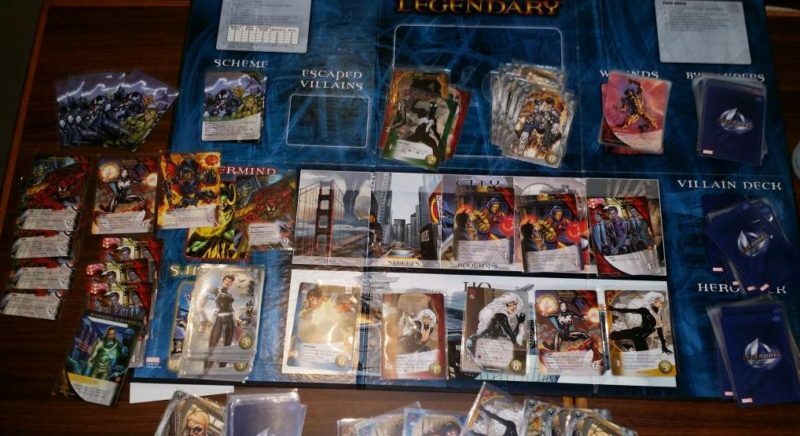 Set in the Marvel Universe, Legendary: A Marvel Deck Building Game is a cooperative deck building game that pits your team of superheroes against one of four Mastermind villains. Using actual characters from the Marvel Universe, including Spiderman, The Hulk, Wolverine and Cyclops, it was designed for people who love comic books and/or the movies based on them. Before you start playing Legendary: Marvel, you have to set up the decks. A villain deck needs to be created based on the Mastermind villain and the scheme that you choose. Players will then choose which hero decks they want to use for that game and shuffle them up. Everyone begins the game with basic S.H.I.E.L.D. agents, who will help you get better cards in your decks and take out some weaker foes. Over the course of the game, players will be using their deck building skills to recruit new heroes, take down villains, and, hopefully, eventually defeat the Mastermind. Every card either has a recruitment value or an attack value, so it’s very easy to see what you can do with each of them. The heroes have additional abilities written on their cards, including superpowers which come into play when you have played another hero from that same class. At the beginning of every player’s turn, the villains move through the city. This means that you will draw a new card from the villain deck and, if the card is another villain, all of the other villains will be that much closer to escaping. Some villains “ambush” you, some simply hit back, and others combo with each other. When you draw a “Scheme Twist” card from the villain deck, you will need to check the Scheme to see what happens to the heroes. When you draw “Master Strikes,” you will check the Mastermind card to see how it affects the heroes. The goal of Legendary: Marvel is to take down the Mastermind four times. If you can do that, everyone wins. If, however, the Mastermind is able to complete his scheme, then everyone loses. 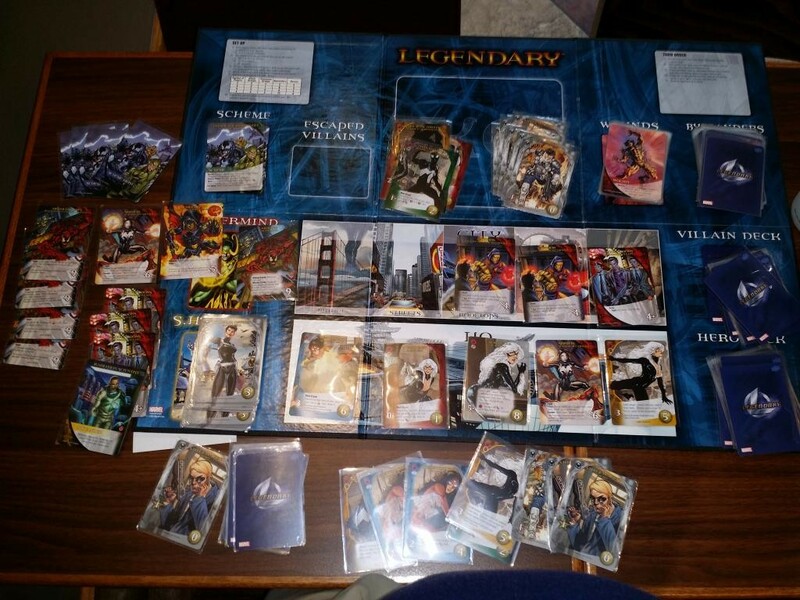 Legendary: A Marvel Deck Building Game is extremely thematic, which is what we were hoping for going into it. Anyone who loves the Marvel universe will get a kick out of this one since most of the popular superheroes are included and their real abilities are used in this game. Legendary feels like a big game, but it actually doesn’t take very long to get through a game. The fact that it can be finished in only 45 minutes is a huge plus since it can be played two or three times comfortably in one gaming session. It’s also a very easy game to teach and learn, which means that new players will be able to join in on the fun in no time. This is great since people of all ages will want to play and it’s not even close to as complicated as it looks. The biggest issue in Legendary is that it can be a tough game to beat with only two players. With more players, the game is a bit easier, but it also takes a bit longer to get through it. It lacks that perfect balance that some people look for, but there aren’t too many cooperative games out there that have it. Setup can definitely be a headache, especially the first time that you take the plastic off of the cards. The game does come with deck separators, but it still takes a good 15 minutes to get everything set up on the mat. Cleanup can take just as long. Since Legendary: Marvel is a thematic game, some people who aren’t into these comic books or movies might not be fans of this one. 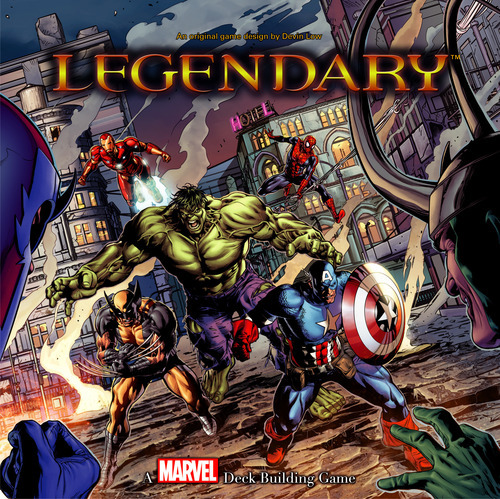 Legendary: A Marvel Deck Building Game is an excellent co-op card game and one that you should pick up if you’re a fan of comic books and/or cooperative games. Upper Deck did a fantastic job of bringing the Marvel universe to life in board game form, which is why it has been one of the biggest hits of the last five years. Most of us don’t like it quite as much as Legendary Encounters: Alien, but it is still a game that hits the table when we need our Marvel fix. Thanks for taking the time to read our Legendary review!